Ich will es nicht beschwören, aber ich bin mir ziemlich sicher, dass der Labelchef von Omega bereits Haute Tension als einen der nächsten Titel bestätigt. Auf jeden kommt etwas von dem inzwischen verstorbenen Francois-Eudes Chanfrault. Ich hoffe es stark. Damals ist es ja zu keiner Veröffentlichung gekommen, da Chanfrault den mehrfach im Film zu hörenden Muse-Song zum Teil auch in seine Scorestücke eingebaut hat und da die Rechtelage schwierig war. Wenn es was von Chanfrault ist, könnte es allerdings auch L'Interieur (Inside) sein, der ja auch in diese französische Terrorwelle fällt. Ich drücke aber die Daumen für Haute Tension. Danke auf jeden Fall für die Infos. Schade, dass Chanfrault schon so früh verstorben ist. Ich mochte seine Scores immer sehr gern, auch wenn sie sicher nicht jedermanns Fall waren. Das mit dem Muse-Song war mir gar nicht bekannt... das könnte eine Veröffentlichung für so ein kleines Label natürlich nahezu unmöglich machen. Könnte also L'interieur sein. Den Score zu Inside von Chanfrault gibt es ja schon, dann wohl doch eher Hate Tension. Da beide Scores nur sehr kurz sind, poste ich die mal hier rein. Back Lot Music will release a soundtrack album for the drama The Mustang. The album features the film’s original music composed by Jed Kurzel (Alien: Covenant, Assassin’s Creed, Macbeth, The Snowtown Murders, The Babadook). The soundtrack will be released digitally tomorrow, March 15 and will be available to download on Amazon, where you can also check out audio samples. The Mustang is co-written and directed by Laure de Clermont-Tonnerre and stars Matthias Schoenaerts, Connie Britton, Bruce Dern, Jason Mitchell, Gideon Adlon and Josh Stewart. The movie follows a convict in a rural Nevada prison who struggles to escape his violent past and is required to participate in an “outdoor maintenance” program as part of his state-mandated social rehabilitation. The drama premiered at this year’s Sundance Film Festival and is being released in select theaters this weekend by Focus Features. Visit the official movie website to learn more about the film. Walt Disney Records has released a soundtrack album for the Pixar animated short Purl. The album features the film’s original music composed by Pinar Toprak (Captain Marvel, Krypton, The Angel, The River Murders, The Wind Gods). The soundtrack is now available to download on Amazon, where you can also check out audio samples. Purl is written and directed by Kristen Lester, produced by Gillian Libbert-Duncan, and features an earnest ball of yarn named Purl who gets a job in a fast-paced, high energy, bro-tastic start-up, where she gets ignored by her fellow employees. The short, which is the first of Pixar’s SparkShorts program, opened at Disney’s El Capitan Theater in January and is now available to stream on YouTube. Watch the full short after the jump. 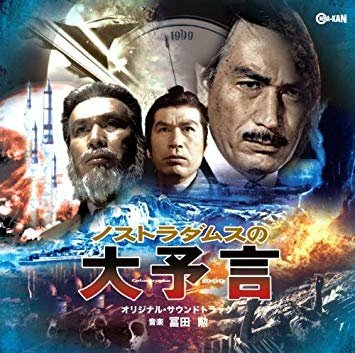 Mehr Japan-Scores von Cinema-Kan. Am morgigen Mittwoch erscheinen ein 4-CD-Set mit Musik aus der TV-Serie Operation: Mystery (1968) und den Nachfolgeproduktionen Second File (2007) und Strange Campaign: Mystery File (2013) mit Musik von Hiroki Tamaki, Toru Fuyuki, Takahiro Saito und Naozumi Yamamoto sowie Katsuhiro Hattoris Score zu dem 1969er Caper-Movie Lady With Seven Faces. 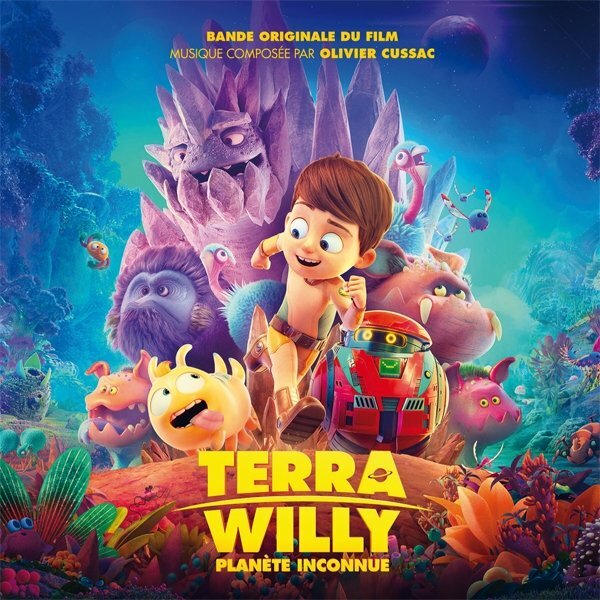 Neben dem Rota-Score kommt von Music Box Records auch eine CD mit Olivier Cussacs Musik für den aktuellen Animationsfilm Terra Willy - Planète Inconnu. Dragon’s Domain Records, to be distributed through buysoundtrax.com presents the original motion picture soundtrack for 976 EVIL II, featuring music composed by Chuck Cirino for the 1991 sequel to 976-EVIL, directed by Jim Wynorski, written by Erik Greenberg and Rick Glassman, starring Debbie James, René Assa, Patrick O’Bryan, Philip McKeon, Leslie Ryan, Rod McCary, Paul Coufos, Karen Mayo-Chandler and George ‘Buck’ Flower. 976-EVIL II continues the longtime collaboration between filmmaker Jim Wynorski and composer Chuck Cirino, which includes films such as CHOPPING MALL, DEATHSTALKER II, NOT OF THIS EARTH, TRANSYLVANIA TWIST, A DOGGONE CHRISTMAS, A DOGGONE HOLLYWOOD and, most recently, A DOGGONE ADVENTURE. Cinetel’s 1988 horror thriller 976-EVIL, in which people who dial that telephone number receive supernatural powers and turn into satanic killers, was not a critically successful film but its modest box office returns were good enough for the production company to approve a direct-to-video sequel. Thus 976-EVIL II, also known as 976-EVIL II: THE ASTRAL FACTOR was released to home video in the UK in December 1991, and in the US the following April. In the second film, rather than dialing the phone number to receive your horrid horoscope, the devil himself phones you, offering the awful astrological announcement when you answer. While short on logic, 976-EVIL II offers a lot of fun for its low-budget proficiency. 976-EVIL II stars the first movie’s Patrick O’Bryan, once more playing Spike, now a drifter and still tormented by his experiences from the first film. Here he pairs up with wholesome coed and “final girl” Robin (Debbie James), trying to convince the local cops that creepy college professor Mr. Grubeck (René Assa) is murdering the locals, an accusation made rather difficult when the murders continue even after the Prof is locked in jail. As he’s sleeping, though, a disembodied astral projection of himself roams free, decimating the community and soon targets Robin and Spike. 976-EVIL II was Chuck Cirino’s tenth film score for Jim Wynorski. The two had met in New York City due to their mutual love for Ennio Morricone, and they reconnected when both wound up in Los Angeles and Jim asked Chuck to score his 1986 movie, CHOPPING MALL. With Cinetel came a larger budget than usual and it was Chuck’s idea, rather than to score the movie wholly with synthesizers, as he had done with all his previous scores, to take advantage of the budget and bring in a small orchestra to enhance his synths. “What I had in mind is emulating what Jerry Goldsmith and Bernard Herrmann had done back in THE TWILIGHT ZONE days, with small orchestras,” Cirino said in a new interview for the liner notes. He hired orchestrator Tim Simonec, who created the orchestral parts. 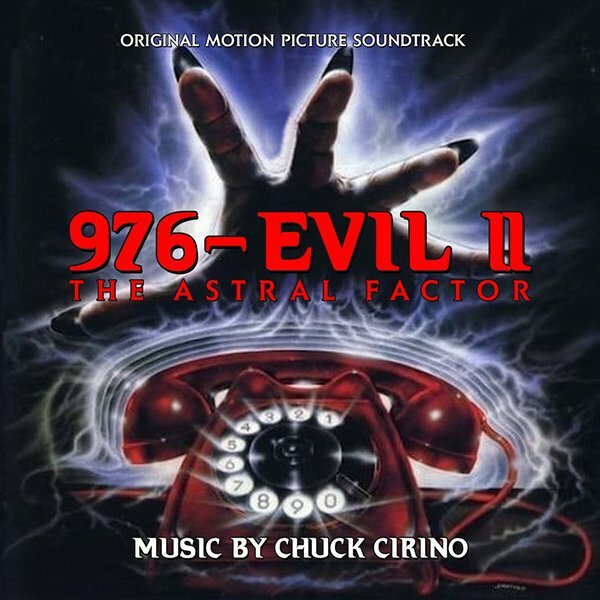 For 976-EVIL II, Chuck was able to craft some highly effective and unique electronic sound structures that enhanced the film’s moments of horror and made some of its more audacious sequences immensely exciting and fun. Regarding the score, director Jim Wynorski had asked for a Spaghetti-Western influenced sound for the main title track, which fit the introduction of Spike, riding into town on his motorcycle in the style of the Man with No Name on his donkey. Cirino composed a standalone piece in the proper vibe, with Ed Tomney performing the guitar solo on the track. The score itself is constructed around a Gothic main horror theme. There is also a winsome romantic theme for Spike and Robin. Beyond these two recurring themes, the score consists of a lot of texturally layered motifs and intricate sonic spookery that maintain a continual tension and scariness throughout the film. Dragon’s Domain Records is excited to bring 976-EVIL II to compact disc for the first time, mastered by James Nelson at Digital Outland with exclusive liner notes by author Randall Larson, with the participation of the composer and the director. 976-EVIL II is a limited edition release of 500 units. As a special offer, the first 50 people to order the album from the record label’s website will have their copy autographed by the composer at no additional charge. 976-EVIL II, to be distributed through buysoundtrax.com, is expected to begin shipping on the week of April 8th. Dragon’s Domain Records, to be distributed through buysoundtrax.com, presents the PAUL CHIHARA COLLECTION, VOLUME 2, featuring music composed, conducted and produced for three films by Paul Chihara (DEATH RACE 200O, PRINCE OF THE CITY, CHINA BEACH). Composer Paul Chihara has had one foot in film scoring (having composed scores for over 90 motion pictures and television series) and the other in concert music for more than 45 years. Currently, at the age of 80, he shows no signs of slowing down, remaining active composing concert music and interacting with music, musical theater, and musicians throughout the world. The three scores collected on this second volume of Chihara’s film music have a lot in common, musically. Each are from the mid 1980s, each demonstrates the composer’s deft articulation with melody, harmony, and the seamless integration of popular, folk, and classical styles, although the movies themselves are quite different. Set in 1969, A WALK ON THE MOON tells the story of an idealistic Peace Corps volunteer named Everett Jones (Kevin Anderson) who is happy to be assigned to a remote Colombian village. When he arrives, he is confused by the cynical attitude of his predecessor (Terry Kinney) and the apathy the villagers seem to hold toward him, but he manages to take up with a shy native girl named India (Patrice Martinez) as he becomes more immersed in their native culture. This adventure drama was directed by Raphael D. Silver (his daughter Dina Silver produced) and was filmed in Mexico, standing in for the landscape of Colombia. The film was nominated for Best Feature at the 1987 Chicago Film Festival, and nominated for the Grand Jury Prize at 1987’s Sundance Film Festival. A WALK ON THE MOON is a splendid score with engaging textures and a remarkable contrast between North American country/folk and South American ethnic music which serves the story’s meeting of the two worlds as much as it presents a compelling listening experience on its own. As the music follows Everett from 1960’s New York City to the lushly forested foothills of western Colombia and the northern Andes, Chihara’s music follows suit. The score is primarily monothematic with a single theme. 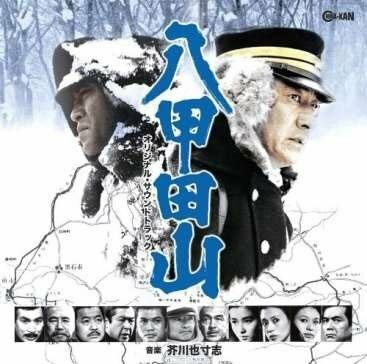 As the movie progresses, the music becomes by measures more ethnic in quality until Everett, having absorbed the culture and people, must face a bittersweet farewell to the village he’s grown to care for but is unable to stay within. Airing on television in 1986, THE LAST DAYS OF FRANK AND JESSE JAMES was a Western biopic with a casting novelty – the main cast was made up almost entirely of country music stars – Johnny Cash played Frank James, Kris Kristofferson played Jesse, June Carter Cash co-starred as the mother of both James boys, while Willie Nelson and David Allan Coe were featured in supporting roles. Actress Marcia Cross co-starred as Sarah Hite, Jesse’s romantic partner. Filmed in Springfield, Tennessee, the movie was directed by William A. Graham, a veteran director of TV episodes and movies, with a handful of feature films to his credit), from a script by William Stratton, who was known for writing for TV movies and series episodes throughout the ‘70s and ‘80s. Part of the PBS “American Playhouse” series, NOON WINE aired in 1985 and was the second filmed version of renowned American writer Katherine Anne Porter’s popular short novel. The film stars Fred Ward, Stellan Skarsgård, Lise Hilboldt, and Pat Hingle, and is an effectively nuanced psychodrama set in 1890s Texas, when a stranger from North Dakota arrives at a small dairy farm seeking work. The family who owns the farm hires him and the farm flourishes. After many years a second North Dakotan stranger arrives, which puts into motion events that wind up having a tragic outcome for all. The score is a mix of folk and country, favoring guitar and mandolin, which adds to the film’s conceptualization as a Western-styled tale of conflict. The score describes and contrasts the narrative’s sense of shifting claustrophobia and enigmatic characterizations. Unlike the gentle, harmonic treatment of the other two films, the music for NOON WINE is complex, sometimes spare, and frequently as intense as the unfolding drama and the psychological underpinnings of the socially uneasy characters who populate the saga while remaining within the pop and classical musical idioms. Among the notable performers on this score are mandolin player Andy Statman and legendary harmonica player Toots Thielemans. 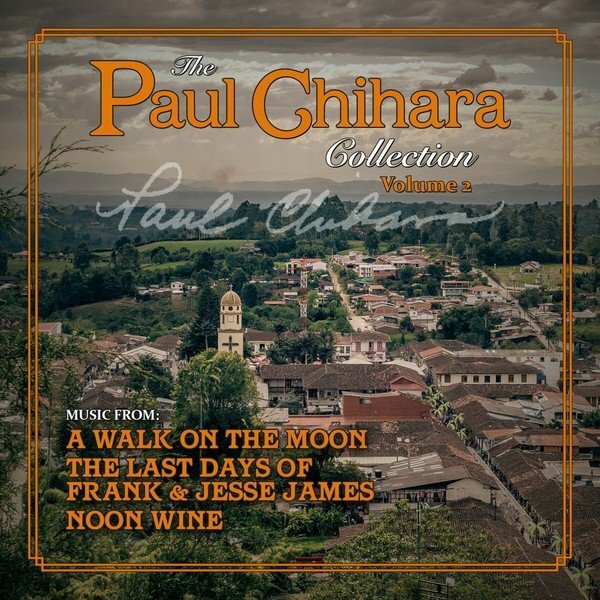 Dragon’s Domain Records is excited to bring Paul Chihara’s music for A WALK ON THE MOON, THE LAST DAYS OF FRANK AND JESSE JAMES and NOON WINE to compact disc for the first time on THE PAUL CHIHARA COLLECTION, VOLUME 2, mastered by James Nelson at Digital Outland with exclusive liner notes by author Randall D. Larson, including the participation of the composer. THE PAUL CHIHARA COLLECTION, VOLUME 2 is a limited edition of 500 units. As a special offer, the first 50 people to order the album from the record label’s website will have their copy autographed by the composer at no additional charge. The album, to be distributed through buysoundtrax.com, is expected to begin shipping the week of April 8th. Neben dem von Stefan in einem anderen Thread vorgestellten L' ossessa veröffentlichen Digitmovies am 5. 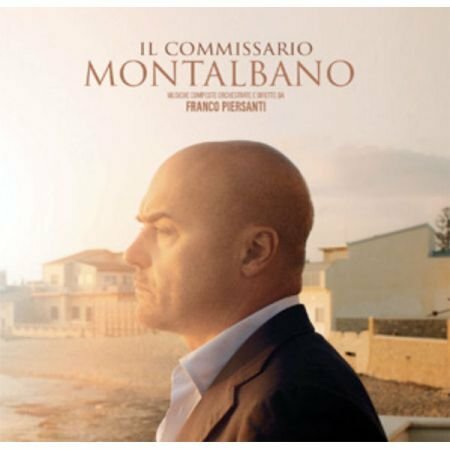 Mai auch eine Neuauflage von Ennio Morricones Ruba al prossimo tuo auf CD und LP. 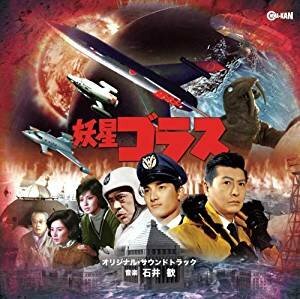 Von Cinema-Kan kommen weitere Doppelalben mit verlängerten Fassungen japanischer Scores: Isao Tomitas Prophecies of Nostradamus, Kan Ishiis Gorath sowie Yasushi Akutagawas Mount Hakkoda. THE FIRST 25 UNITS PURCHASED DIRECTLY FROM OUR ONLINE STORE WILL BE AUTOGRAPHED BY THE COMPOSER.